The Surin Moken Experience tour, which began last year, saw seven different groups this season! This new and exciting program highlights the many interesting aspects of the Moken culture on Koh Surin. Guests are able to experience Koh Surin through the eyes of the Moken by actively engaging in activities chosen by the Moken to share with guests and continue the knowledge of their culture. Here you can snorkel in the turquoise waters with your Moken guide pointing out the vibrantly colored corals and underwater life including hawksbill turtles, clown fish, octopus, sea fans and sea anemone. The tour allows for cross cultural exchange in a fun way! The Moken teach guests how to spear fish, row their traditional wooden boats, explain about their traditional lifestyle and their uses for different plants in the surrounding forests. This program allows the Koh Surin Moken community to actively engaged in the tourism taking place in their village and on the Surin Islands. The program began during the 2012-13 season when a previously established Moken Tourism Group reunited to take responsibility for decisions regarding guests entering the village and supplying local guides to help actively engage visitors. They have continued to improve the nature trail with signs in English explaining the medicinal uses of plants, an informational sala that covers interesting topics regarding Moken culture. The group has also been working hard to refurbish the last Kabang house boat in the village to help explain and conserve their traditional way of living life at sea. The Moken guides are gaining confidence, looking forward to welcoming more guests and to the future development of this truly unique and amazing program! 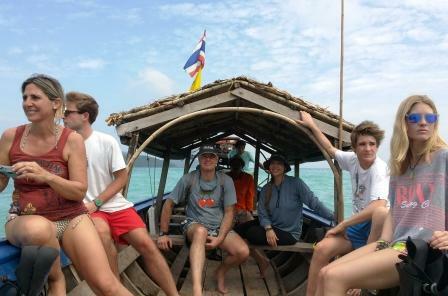 “I got gained knowledge about the sea and nature on Koh Surin from my knowledgeable Moken guide. Hey, just wanted to say I enjoyed the article on the Moken. I also need to share the maternal Moken lineage within the very rare mtDNA T2b6b (M46) which is a Moken trait. For too many years I’ve researched the “situation” here in California, to learn that our Moken group migrated into Singapore, perhaps as Chinese Malays, or Tamils.